POV: Nokia with a hole-punch display is Nokia 6.2? Let me start first by saying that this post is purely based on unverified leaks and rumors and it contains my assumptions (which are the mother of all fu*kups). After this is cleared, OnLeakes shared high quality renders of a new Nokia device that will feature punch-hole display or the display where the notorious notch is replaced by a small hole with the front-facing camera. OnLeaks said that he thinks this is Nokia 8.1 Plus, but he was just assuming that because of the dimensions and screen size of the device. We are aware that HMD is changing the naming scheme and that Plus series are no more. So, this new device can’t be 8.1 Plus. But it can’t be a new Nokia 8.2 since 8.1 was announced recently, and announcing a new model that just has to be released globally is a bad business decision. My logic tells me this could easily be the all-new, fully redesigned Nokia 6.2, and let me explain it. The hole-punch display was first launched by Samsung on a midrange device, and Honor did the same later on. HMD didn’t wait long, as we can see from the leaked renders, and it would be good to test the new front camera arrangement with a device that won’t cause big financial damage. Also, when HD renders are released, that usually means that the device is almost ready to be announced. It can always happen that OEM stops the announcement what we saw with numerous Nokia devices, but the investment needs to be returned, so there is a low chance of that happening. Nokia 6 was the first Nokia device to be launched, and that happened in the early beginning of 2017 and 2018 for the Chinese market. Since renders are already done, this device could be heading first to China where HMD wants better sales result. My assumptions stopped there, but newly formed Twitter account Nokia Leaks, just leaked some rumors about Nokia 6.2. The account is created just recently and you shouldn’t take it as a trusted source of info about Nokia devices just yet, but it shares the same logic, an assumption with me, or even correct info if Nokia 6.2 is a real deal. Nokia 6.2 (6 2019): 6.2-inch display with camera hole-punch, Snapdragon 632, 4/6GB RAM, 16MP Dual-rear Zeiss Camera,OZO Audio, First market China. Coming Jan end/Feb 2019. 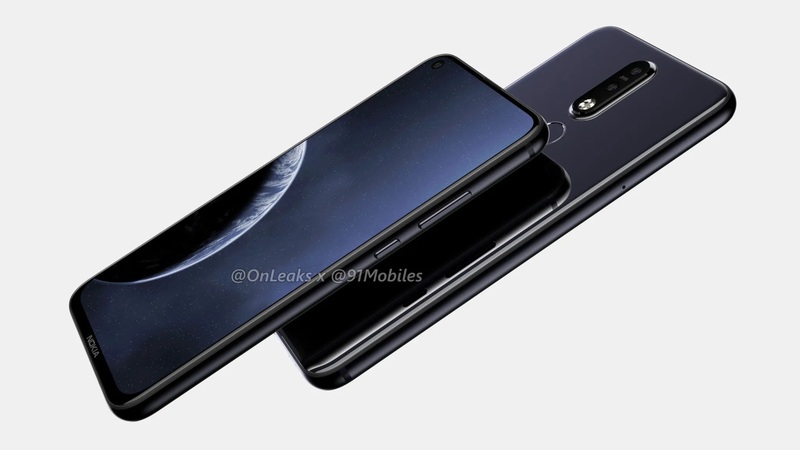 Nokia leaks tweeted that this is actually Nokia 6.2, which will have a 6.2-inch display with camera hole-punch, dual Zeiss camera at the back, what we already know, but also Snapdragon 632, 4/6GB RAM, 16MP Dual-rear Camera, and OZO Audio. The first market to see the device will be China according to Nokia Leaks and the device could be coming just before the Chinese New Year, or at the end of January and early beginning of February 2019. The design of the device differs a lot from what we are used seeing with model 6. Nokia 6 is a tank among the smartphones and this one could be also, but looks more premium. Additionally, some things like small chin which usually is reserved for higher price range phones because of the more expensive display controlling hardware used to make the bezel smaller could suggest this is a model more expensive than 6. But, if Snapdragon 632 is indeed coming with this one, maybe Nokia 6.2 could be the first Nokia device with a hole-punch display? Is it punch-hole, hole-punch, or pin-hole display? Anyways, what are your thoughts about it?